The market for brass quintet recordings is miniscule when compared to that of popular music. In an already small market with lots of very fine sounding ensembles, new groups really have to bring something special to the table in order to succeed. 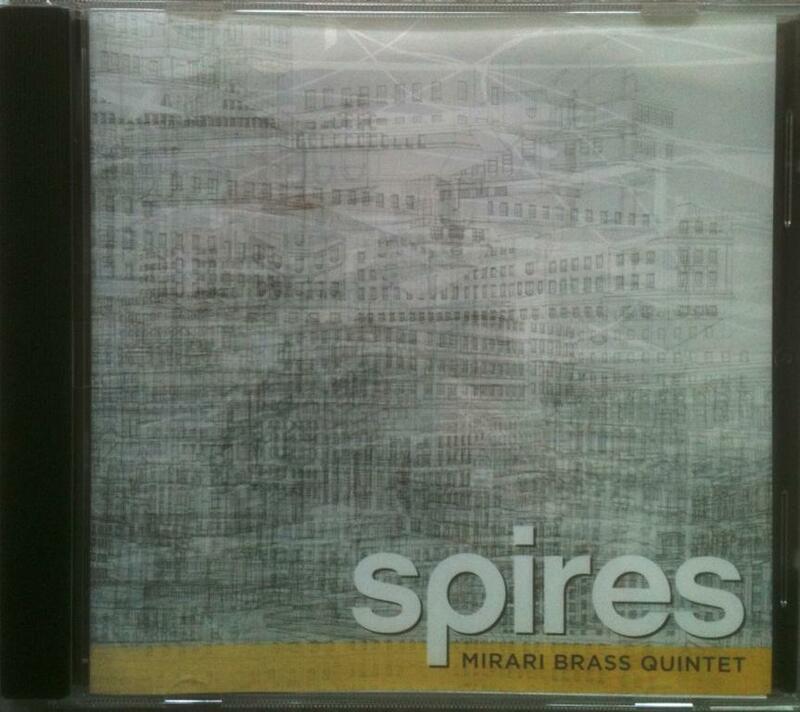 I think Mirari Brass has done that with their debut CD, Spires. I heard them perform live in February of this year, and here is what I said back then. To my ear, their first album – titled after the Eric Nathan work which they commissioned and recorded – captures all of the excitement and variety of the live performance. Having heard them in person, I can say that the recording gives a very accurate representation of the ensemble’s abilities, which is not always the case, both in classical and popular music. Here’s a brief overview of each track on the CD. Canyon Run, Alex Noppe: As well as performing on trumpet with the group, Noppe is the principal arranger for Mirari Brass and has also composed original works for them. The opening track provides a spirited introduction to the rest of the album. From the get-go the ensemble grabs your attention with clean, virtuosic playing. Revecy Venir du Printans, Claude le Jeune/arr. Noppe: Renaissance transcriptions are traditionally very popular with brass groups, and Noppe’s arrangement of this 16th-century Chanson really sparkles. To my knowledge this is the only recording, but I imagine that other quintets would really enjoy performing this arrangement as well. Contrapunctus IX, J.S. Bach/arr. Ralph Sauer: This staple in the quintet literature shows off the precision and balance of this recording. Though it is a studio recording, there’s still a nice resonance to both the group sound and individual instruments. Spain, Chick Corea/arr. Noppe: This is one of my favorite tracks on the album, along with the final two tracks – transcriptions of tunes by Charles Mingus, Goodbye Pork Pie Hat and Haitian Fight Song. All three works fit the group extremely well, and it shows in the energy and passion with which they play them. Lots of quintets can play jazz, but not many can pull off these kinds of tunes. Spires, Eric Nathan and Quintet for Brass, Austin Jaquith: I’m combining my discussion of these two works because they were both commissioned by the Mirari Brass, and because they are the most contemporary-sounding pieces on the CD. They play both pieces with an incredible amount of dynamic and stylistic contrast, and pull off the extended techniques in Eric Nathan’s Spires with ease. As always it’s great to see collaborations of this sort between composers and performers. Nessun Dorma, Giacomo Puccini/arr. Tony Rickard: This arrangement features Mirari’s horn player, Jessie Thoman, playing the famous tenor aria. Though it would be easy for the horn melody to be buried in a brass quintet, the balance is quite good on this recording. Thoman’s sound on this track, and on the entire album, is exactly what the music requires, ranging from big and warm to brassy and penetrating. It should be noted that Rickard’s arrangement is transposed up several steps from the original pitch, but Thoman makes even the soaring line at the end sound easy. I’ve listened to lots of brass quintet recordings: in my dissertation research I spent hours poring over brass quintet scores and listening intently to dozens and dozens of recordings. When it comes to musicality, variety, and sheer energy in performance, this new recording by Mirari Brass compares very favorably to other recordings by big name artists.